Today was one of those days where I sat down with an idea of what I was going to stamp and ended up with something completely different. I really like the way this card came out so I'm glad it worked out because my original idea just wasn't working the way I saw it in my head. Does that ever happen to you? After I scrapped my first idea, I wondered how a white embossed image would look on a piece of my favorite Wood Textures DSP. I don't know about you, but I said "WOW" when I saw how pretty the snowflakes looked, and decided to use it as the background for this card. I added a couple of other simple elements and I LOVE the rustic result. I had already decided what I was going to do for my Christmas cards this year, but there is a high probability that I am changing to this! The snowflake and sentiment are from Cheers to the Year set. I especially like the images in this set, but it's also very versatile because it includes images that can be used for Christmas, New Year's AND a wedding or anniversary. I used the boxwood wreath embellishments and this same sentiment on a gift packaging idea a few weeks ago, and I used the Stamp-a-ma-jig to place the sentiment on the banner. That post includes a good picture tutorial on how to use the Stamp-a-ma-jig, if you're not familiar with it. You can see it HERE. I was really pleased with how that project came out as well...it's nice when you can use an idea you like in more than one way, and get a different look! 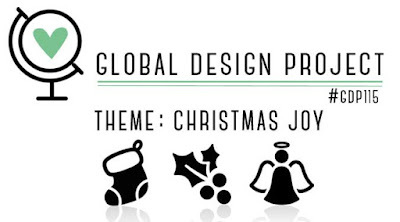 You can head over to the Global Design Project page by clicking HERE to see all the pretty projects this week!